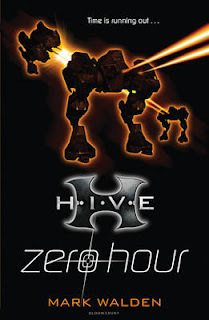 Readers of this blog will already know that I am a huge fan of the H.I.V.E series by Mark Walden. Now, thanks to the generosity of Ian Lamb from Bloomsbury, you have the chance to win a set of the series so far. Yes... that's six books in total. In order to win all you have to do is fill in the form below with the answer to one simple question and your details. The first name drawn at random after the closing date will win a set of six books (and possibly a few extras like stickers, etc). Deadline for your entry is 8pm Saturday 2nd October. This contest is open to UK entrants only. Neither I or the publisher will be held responsible for items lost in the mail. Well done and thank you to everyone who entered. I will now endeavour to contact the winner through by email. Please reply within 48 hours or I will draw another name out of the hat. Many thanks to Headline for providing the prize. Seems like I am forever doomed to be slightly behind the times when it comes to TimeRiders news as I think this design for the third book in the TimeRiders series may have been unveiled to the world almost a month ago. What the heck - it is new to me so I thought I would post it anyway. In the interview that Alex Scarrow did The Book Zone he mentioned that Robin Hood would make an appearance in The Doomsday Code and I think this cover is a cracking representation of this. If you look carefully you will also spot a code on the cover that requires cracking (if you click on the image you should be able to see a larger version). Head on over to the official TimeRiders blog to find out more about this code. Sadly TimeRiders: The Doomsday Code is not scheduled to be released in the UK until February so in the meantime we will just have to keep on guessing as to what Alex Scarrow has in store for the team next. Even though it has only been five months since I read the first three books in the Changeling series (pretty much back-to-back as I was playing catch up), it feels like much longer. I wrote a review at the time in which I stated that I was really looking forward to seeing what happened to Trey, Alexa et al next, and this sense of anticipation was heightened even further by the interview that Steve very kindly did for The Book Zone. It was with no small amount of excitement then that I came home from work recently to find a package from Macmillan waiting for me - Demon Games had finally arrived. The thing I like most about Steve Feasey's writing is that he manages to make every book seem fresh - even though each one is a continuation of a story, he skilfully alters the tone for each new episode. The first book was very much about Trey discovering that he is not a normal boy; Dark Moon saw him gradually coming to terms with his powers, and developing them to the point where he was able to use them in combat, albeit still somewhat reluctantly. And then along came Blood Wolf, a book that was far more about Trey's feelings and his character than the previous two episodes had been; yes, there were other events happening involving Alexa, Philippa and Lucien, but exciting though they were, as a reader I fraced through these scenes to get back to the story of Trey in Canada. With Demon Games Steve Feasey yet again allows his writing to take a different direction - this book is all about bringing the various plot strands together to set us up for a (hopefully) mind-blowing finale in the final book in the series, Zombie Dawn. Demon Games sees Trey entering the Netherworld proper for the first time in the series. Whilst he was soul-searching in Canada things went pretty badly for his friends back home, and Alexa has now ventured into this land of demons on a mission of her own. Trey, who is finally admitting his feelings for Alexa (to himself at least), realises that the only option is for him to launch his own rescue mission and follow her into the unknown, especially as Lucien is currently AWOL. As such the story is a little more fragmented than previously, as the point of view jumps between the stories of the different characters, from Trey to Philippa, then on to Lucien, Alexa or Caliban and back again, but this jumping around adds to the excitement I felt as a reader as many of the chapters end on a cliffhanger for one character, and we don't necessarily get to discover the resolution of this moment of tension until a chapter or two later. By using this method of telling his story Steve Feasey manages to keep the tension levels are almost inbearable levels, and the reader fully interested in every character's story, and not just Trey's. Having the whole story set in the Netherworld also allows Steve Feasey to let his imagination run riot, with vivid descriptions of landscapes, cities and inhabitants, and it is this latter category where he really lets rip - there are more demons and nether-creatures in this book that any of its predecessors, and most of them are pretty nasty. The Demon Games of the title are an event that Trey find himself competing in (I will leave you guessing as to the prize if he winds), and I have a feeling that the author had a great deal of fun in writing these scenes. Like all great 'penultimate book in a series' books Steve Feasey leaves some tantalising loose ends to keep us hungry for the final episode, and judging by the final revelations in Demon Games, and the amazing cover for Zombie Dawn, I think Changeling fans are in for one hell of a treat with the next book as well. Steve also has a growing legion of fans in the US, where the first book in the series was released as Wereling back in April, and Dark Moon scheduled to be published in February 2011. I feel a little sorry for American fans of the series that they are so far behind us UK readers, but please believe me US readers of The Book Zone - the wait is more than worth it. Demon Games is available to buy right now and my thanks go to Macmillan for providing me with a copy to review. I love this 'job'! Beneath heaven is hell. Beneath hell is Furnace. Furnace Penitentiary. The world’s most secure prison for young offenders, buried a mile beneath the earth’s surface. One way in, no way out. Once you’re here, you’re here until you die, and for most of the inmates that doesn’t take long - not with the sadistic guards and the bloodthirsty gangs. Convicted of a murder he didn’t commit, sentenced to life without parole, 'new fish' Alex Sawyer knows he has two choices: find a way out, or resign himself to a death behind bars, in the darkness at the bottom of the world. Only in Furnace, death is the least of his worries. Soon Alex discovers that the prison is a place of pure evil, where creatures in gas masks stalk the corridors at night, where giants in black suits drag screaming inmates into the shadows, where deformed beasts can be heard howling from the blood drenched tunnels below. And behind everything is the mysterious, all-powerful warden, a man as cruel and as dangerous as the devil himself, whose unthinkable acts have consequences that stretch far beyond the walls of the prison. Together with a bunch of inmates - some innocent kids who have been framed, others cold-blooded killers - Alex plans the prison break to end all prison breaks. 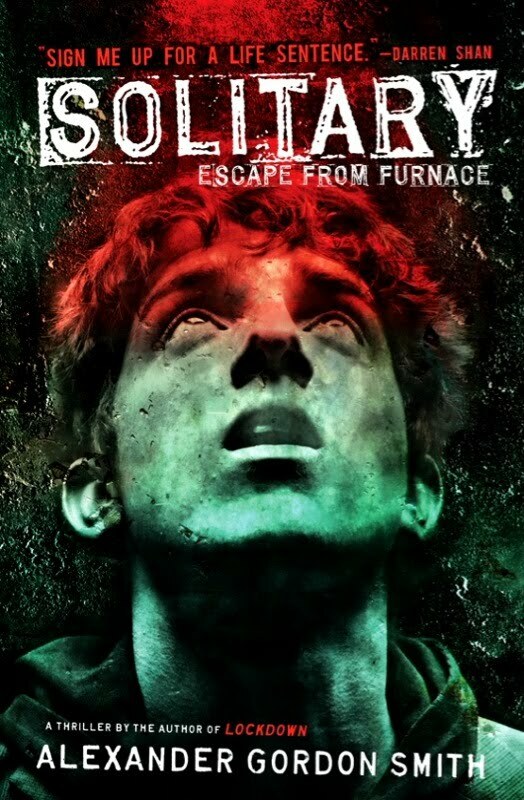 But as he starts to uncover the truth about Furnace’s deeper, darker purpose, Alex’s actions grow ever more dangerous, and he must risk everything to expose this nightmare that's hidden from the eyes of the world. About 18 months ago I made a huge mistake. I didn't know it at the time, but I certainly do now. I guess I'm only human but I am still a little disappointed with myself. What did I do? 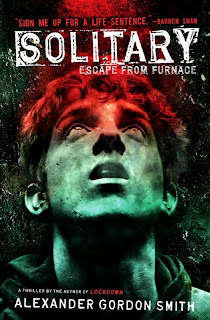 I took a quick glance at a copy of Alexander Gordon Smith's Furnace: Lockdown, didn't read the blurb fully, and assumed that it was just a story about an innocent boy being locked away in prison, and everything that entailed. Sort of a Prisoner Cell Block H for young adults. I've never been a huge fan of claustrophobic prison books/films/TV series (except for the amazing Shawshank Redemption) so with a huge To Be Read pile (and this was long before I started this blog) I didn't think to give it a closer look. This meant I did not spot the sinister looking gasmask wearing figures on the cover (hey... they are pretty small and not exactly a focal point). I didn't spot the line in the blurb that read "scarred, twisted and hungry for blood". I didn't read (I now discover to be) one of the best YA books for boys that was published in 2009. Over the last six months or so I have heard several people mention this series, most recently my friend Liz from the My Favourite Books blog, but with so many books to read, and so little time to do so, it was still looking unlikely that I would ever pick it up, or at least not in the foreseeable future. 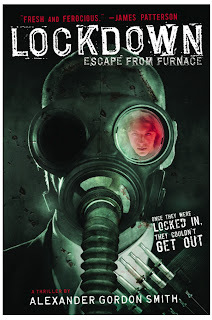 Until that is I received an email, out of the blue, from the author's US publicist, informing me that they were about to release Escape From Furnace: Lockdown in paperback in the USA, he had read (and loved) my blog and would I like a copy? Rarely one to turn down the offer of a free action-packed YA title that I have heard is cracking I said an immediate "yes please", a reply that may just have sounded a little too excited as I had just seen the cover design for the US paperback edition (the photo at the start of this post). What a fantastic cover - if I had seen this book cover in that shop 18 months ago I would have picked it up and bought it immediately. On balance I tend to prefer UK covers over US covers, but definitely not in this case. If you haven't discovered this series yet then please don;t wait any longer and end up regretting it like I do. And this message goes out to all my US readers as well. This book is nothing short of brilliant. It is fast-paced. It is frantic. It has cliff-hanger chapter end after cliff-hanger chapter end. It is a cracking thriller, with some great horror - lashings of bloody, violent, terrifying horror. It has a great voice, in the form of narrator Alex, a not-so-nice teen who has been involved in bullying, theft, breaking and entering, but nothing overly violent, and then one night he and his friend break into a seemingly deserted home and the next thing he knows Alex is witnessing his friend being shot in the head, and Alex is being framed for the murder. Due to a summer of gang violence some years before, the goverment takes a very hard line on teen crime now, and the sentence is invariably life imprisonment in Furnace, a prison built deep under the ground. But this is no ordinary prison - it is staffed by the same hulking brutes that framed Alex, as well as the ghastly looking gasmasked Wheezers. To say much more about these would risk spoling the delightful horrors in store for you when you read this book. There is more to this book than just the horror and the action though. Without ever being in-your-face moralistic, it is also about a young man looking back over the course his life has taken so far, spotting the moment when it all started to go wrong, and regretting the actions he took as he got in with the wrong crowd. There are moments of genuine kindness shown in the most desperate of situations, and highlights the importance of friendship and loyalty. You really will run the gamut of emotions when reading this book, as you share Alex's despair, his anger, his hope and his terror. The book ends on something of a cliffhanger but in this case I do not mind one little bit - I have been left salivating for more and intend to start on Solitary at the weekend. Furnace: Lockdown was released in paperback in the UK in March 2009, and in the US in August 2010 (as the Escape From Furnace series). 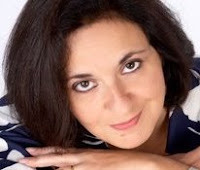 In the UK there have so far been two more books in the series, entitled Solitary and Death Sentence, the former of these two scheduled to be released in paperback in the US in December, with Death Sentence following in 2011. The fourth book in the series is about to hit stores in the UK in October, and is called Fugitives. Alexander Gordon Smith is appearing at the Crystal Palace Children's Book Festival on 23rd October and is now part of the soon-to-be imfamous Chainsaw Gang. I guess I had better make sure I catch up with the series before then. My thanks go to Wes at FSG in the US for his kind words about my blog, and more importantly for helping me to rectify a huge mistake in my life by sending me this book to read. 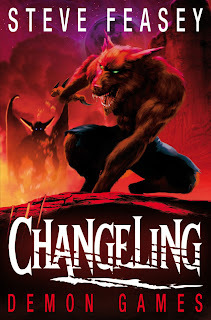 I am currently not far off finishing reading Changeling: Demon Games, the fourth book in Steve Feasey's fab werewolf series (known as the Wereling series in the USA). I hope to get my review online by the end of the week, but in the meantime I just HAD to share this little piece of news with you. Earlier today Steve Feasey posted an image of the cover for Zombie Dawn, the fifth and final book of the series, on his blog and it is such a great cover that I wanted to post the image here too. 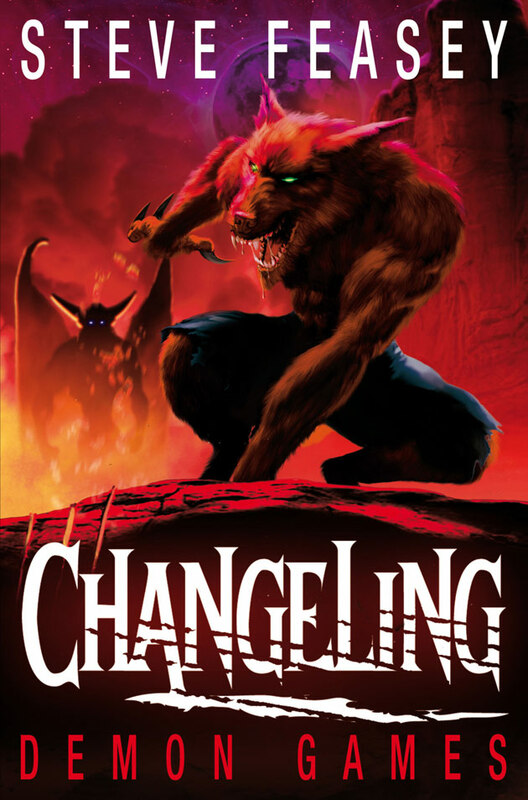 In my opinion it is the best of the Changeling covers so far.... what do you think? This certainly gives Changeling fans something to look forward to. I'm not sure when the exact release date is yet - as soon as I know I will add it to this post. Earlier this month I posted a review of the brilliant Trash by Andy Mulligan, a book that had me captivated from the very first page. 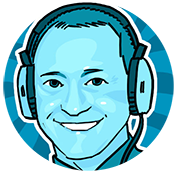 I therefore jumped in head first when offered the chance to send Andy a few questions for him to answer for The Book Zone. How would you describe Trash to a potential reader? I’d say it’s a thriller in which a bunch of very determined, very ingenious children take on the police. I’d say it’s a window into a horrible and horrific world – one that really exists. I’d say it’s a page-turner that will expose you to some pretty unpleasant things and will get your heart racing! I know you have done a lot of travelling and have visited several dumpsites – what was it about them that inspired you to write Trash? The image of children crawling in rubbish. Simple as that – it’s a scene from The Inferno, it’s a circle of hell. You see these kids, often just in shorts, with a hook. They are doomed to sift those xxxxheaps all day, in rain or sun. And next to the seven year-old is the seven year-old’s grandfather, still sifting – and you realize you’re looking at that child’s destiny. The dumpsites are the most extreme reminders I’ve ever seen that our world is insane. The characters of Raphael, Gardo and Rat are incredibly engaging – please tell me they are based on real people you have met. Yes, they are. I tend to fuse individuals together, so that (for example) Rat is two boys – one a very derelict junkie twelve year-old in Manila, fused into one of the most ingenious child crooks I ever met in Calcutta. The common-denominator is this survival instinct, this feral need to win in a situation. When you have nothing to fall back on – when there’s no parent or teacher or policeman to help you up and take you home – you don’t have the luxury of despair. You use the skills you have – your brain, your charm, your speed – and you have to win something, just so you can eat. Why did you decide to tell the story in the voices of the different characters, rather than just Raphael’s? Trash is a cracking mystery adventure story, with plenty of humour, but also involves a large degree of social comment – do you think it is important that children are exposed to issues like this in their fiction? Yes. No. I don’t know. I think children enjoy books that lift them out of their own world. When I was growing up I loved Enid Blyton because she took me to boarding schools and I went to a boring day-school. I loved Carrie’s War because Nina Bawden plunged me into wartime, where the protagonists encountered such new things. I really hate ‘issue books’, and I’ve had to teach them – they are miserably thin gruel. Take a book like Louis Sacher’s Holes – it’s not a book about crime and punishment, or racism, or keeping promises, or any of that school-assembly bilge. It’s about children in an extreme situation, dealing with it. 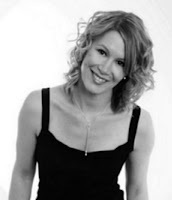 No – I have decided the answer – no I do not think children need to be exposed to ‘issues’ – I think they need to be exposed to good stories and good characters, and if the characters are real then the issues will be there. In my review of Trash I compared it to Louis Sachar’s Holes, with its combination of humour, mystery and social comment. How do you feel about this comparison? As Holes is one of my favourite books – a masterpiece – I’m very flattered! Do you have time to read any of the many books for children that are published these days? If so, do you have any current favourites? I don’t read as much as I should, but I am currently enjoying Half Brother by Kenneth Opel and am about to start the long awaited Noah Barleywater Runs Away by the amazing John Boyne. I loved Enid Blyton and Anthony Buckeridge’s ‘Jennings’ books – I was an addict, saving up to buy them. ‘Jennings’ was the first book that made me laugh out loud. A much loved Primary teacher read us the surreal and spellbinding Marianne Dreams, and I think I was realising what stories could do. Then I was lucky – I had a great English teacher, and books started to hit me like express trains. To Kill A Mockingbird! The Catcher in the Rye! I was never really into action books or fantasy, though I did enjoy Alan Garner. What can we expect next from Andy Mulligan? I’m off to India to write my India book. I’ve spent a lot of time in Calcutta, and love it, and have been working on a children’s book about an English girl marooned in a foreign world. I am going to sit down for a few months, and try and write it. Thank you for your time. Is there anything else you would like to say to readers of this blog. It’s a pleasure. Anything else to say? Only thank you for taking an interest – I really hope you enjoy Trash. It’s a book very close to my heart. I know the last couple of months have been incredibly busy for Andy as Trash has been such a big success so far. My huge thanks go to him for taking the time to answer my questions, and I really hope that Trash continues to gather fans all around the world - there is no doubt in my mind that it will. Hopefully there will be a few more that fit the theme. If you fancy joining me in this challenge then it isn't too late - just pop along to the Stainless Steel Droppings blog and sign up. 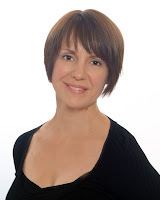 I just posted a review of Scarlett Dedd, the second book from author/illustrator Cathy Brett.Now, thanks to the generous people at Headline I have a copy of Scarlett Dedd to give away. In order to be in with a chance of winning a copy of this book all you have to do is fill in your details on the form below. The first name drawn at random after the closing date will win a copy of the book. Deadline for entries is 8pm Wednesday 22nd September. This contest is open worldwide. 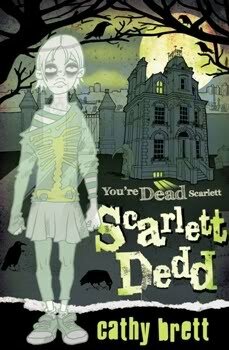 Scarlett is absolutely mortified (in more ways than one) to discover that she's accidentally killed herself while trying to get out of a school trip. Even worse, she's taken her entire family with her. It is rare that I will read a book that I am unsure about before I even pick it up, however I had picked up such a great buzz from other reviewers about Cathy Brett's previous book, Ember Fury, that when Headline asked me if I would like a copy I quickly said yes. Why was I unsure about Scarlett Dedd? Well this is not the sort of book I would normally read and as far as this blog is concerned I just wasn't sure whether it would appeal to boys or not. However, my concerns were unfounded - this definitely has boy appeal, although I would like to add that it may not appeal to all boys. If you love non-stop action and death-defying adventure in your stories then this probably is not the book for you. If instead (or as well) like stories that are quirky, laugh-out-loud funny, and also somewhat morbid in a Tim Burton / Addams Family kind of way, with plenty of Shaun of the Dead style comedy gore, then this may just be the book for you. It will also have an appeal to many reluctant readers as it is a fascinating hybrid of novel, graphic novel and blog entires, with pretty much some form of image on almost every double-page spread, all drawn by the author herself. Cathy Brett has been, amongst many other things, a fashion designer, a theatrical scenic artist and these days a lecturer in design, and she claims that she "unashamedly plunders her students' lives for sensational storylines and characters". As a teacher myself I can well believe this - some of the things that go on in this book are simply too good to be totally fictional - and whatsmore, despite the ghostly subject of the book, the teenagers in the story are more real than most you will find in YA literature these days. These characters actually mess around like real-life teenagers, often being exceedingly immature and doing all kinds of hilarious things. If you're like me, your teenage years are not (ok... for me it is a case of were not) made up of foiling dastardly plots to take over the world, or having to act mature incredibly quickly in order to cope with whatever awful event has been thrown at them by the author. This is such a breath of fresh air. All in all this book came as an incredibly big surprise to me (I really am a typical boy when it comes to books and films - I just love a good shoot 'em up or an Indiana Jones style adventure moment). Like I said, I am not sure all action-loving boys will like it as much as I did but I hope they will give it a try. If not, then at least love it for the illustrations - it's worth buying just to look at the pictures. My thanks go to Headline for sending me a copy to review. Actually, they sent me more that one copy so watch this space for a book giveaway coming very soon (maybe even tomorrow if I have the time). Nope... not a review just yet, just a little taster of what is to come next month. Many of you will already know that Rick Riordan has started a new series, the first book of which is due out on 12th October. For those of you who didn't know this and are now saying "yeah, yeah we already know..... it's based on the ancient Egyptian Gods abd it came out earlier this year" I am not talking about The Kane Chronicles, I am talking about his new Heroes of Olympus series. Yes... that Olympus. The Percy Jackson Olympus. It seems like Rick Riordan cannot stop writing at the moment, and now wants to take readers back into the world he created with his phenomenally successful Percy Jackson books. 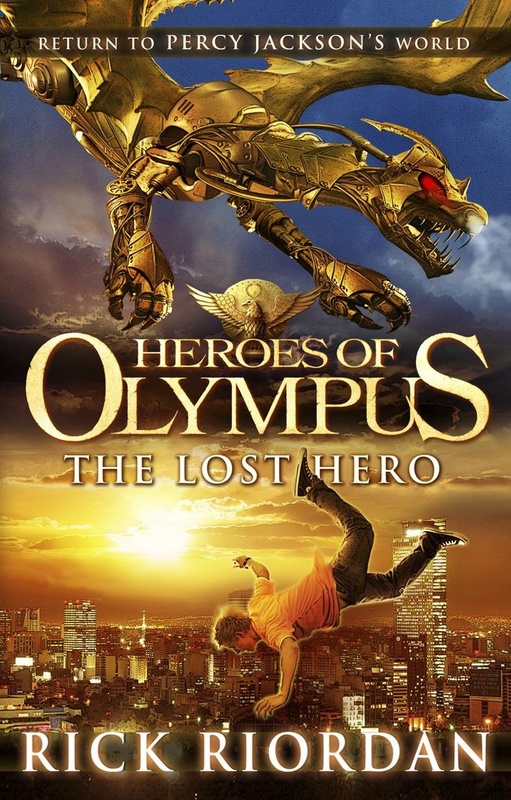 The first book in the series is entitled The Lost Hero but you are unlikely to find any reviews of it before its release date as it is under a world-wide embargo. As a reviewer I find this sort of thing very exciting - I love the idea that everyone gets the chance to own a copy on the same day and I have fond memories of waiting in anticipation for the last few Harry Potter books, and not daring to turn the TV on during the day of release for fear of hearing spoilers. I also remember reading The Half-Blood Prince well into the early hours of a Monday morning so that none of my students at school could ruin things for me. If you want a sneaky peak at the first two chapters of The Lost Hero you can download them from here or alternatively see them online now at http://www.percyjackson.co.uk/, as well as finding out all sorts of other information about Rick and his fantastic books. Despite being very busy writing Rick Riordan is also somehow finding the time to travel over to Britain for a book tour. I am very excited to have just bought a ticket to hear him speak in Winchester on 31st October as part of the Wessex Children's Book Festival (details can be found here), and he is also going to be making a public appearance to sign books at Waterstones in BlueWater on Saturday 6th November. 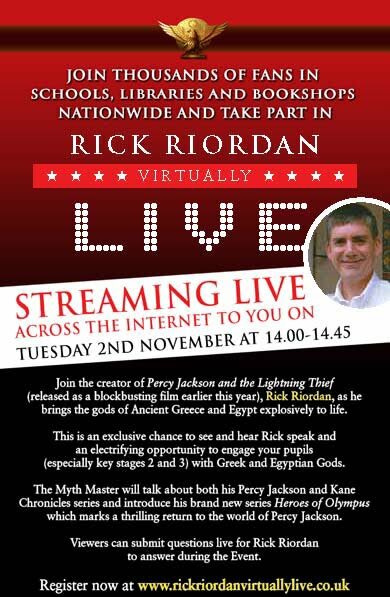 I am also very excited about an event called Rick Riordan: Virtually Live which is going to take place at 2pm on 2nd November. School, libraries and individuals can sign up now to register to watch a live webcast by Rick at http://www.rickriordanvirtuallylive.co.uk/ (some of you may remember Eoin Colfer taking part in something similar ealier this year). I hope many schools across the country (and possibly further afield) will take the time to register for this and allow some of their students to watch it and submit questions for Rick to answer. Of course, when the book is released there will definitely be a review posted on The Book Zone as soon as I have read it so please watch this space. Michael Vyner recalls a terrible story, one that happened to him. One that would be unbelievable if it weren't true! Michael's parents are dead and he imagines that he will stay with the kindly lawyer, executor of his parents' will.... Until he is invited to spend Christmas with his guardian in a large and desolate country house. His arrival on the first night suggests something is not quite right when he sees a woman out in the frozen mists, standing alone in the marshes. But little can prepare him for the solitude of the house itself as he is kept from his guardian and finds himself spending the Christmas holiday wandering the silent corridors of the house seeking distraction. But lonely doesn't mean alone, as Michael soon realises that the house and its grounds harbour many secrets, dead and alive, and Michael is set the task of unravelling some of the darkest secrets of all. The last twelve months have been a cracking time for teen horror lovers, and in particular those who love their horror to be set in a bygone era. We have had Rick Yancey's Monstrumologist (sequel out very soon by the way), Jon Mayhew's fantastic Mortlock and now Chris Priestley has delivered The Dead of Winter. 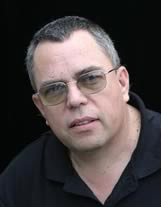 Chris Priestley is well known amongst horror lovers for his three volumes of short stories: Uncle Montague's Tales of Terror; Tales of Terror From The Black Ship; and Tales of Terror From The Tunnel's Mouth. I loved every one of these three volumes, filled as they are with their spine chilling tales of the macabre, and featuring the beautiful illustrations of David Roberts. The Dead of Winter is the author's first full-length novel for publisher Bloomsbury, and while it does not feature those aforementioned illustrations, it is certainly not lacking in the chill stakes. The Dead of Winter is a classic ghost story of the haunted house variety, something which is not seen too often in horror for young people these days. 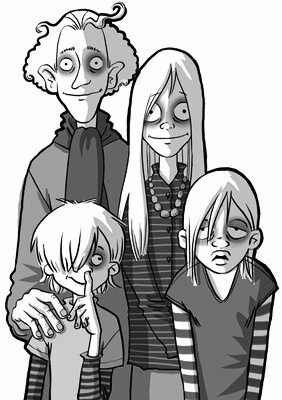 Many modern horror writers for this age group generally deliver exactly what their fans expect of them - blood and gore. Long time readers of The Book Zone will know that I am not averse to these elements myself, however it is refreshing to read a book that is genuinely spooky, but without the splatter. Please believe me when I say that this book is spooky - this really is the kind of tale that could have children asking to sleep with the bedroom light on. And if they live in an old house then they may as well forget about sleeping altogether - they will be far too occupied pulling the bedcovers tight around them as they fret about any bump or creak they may hear during the night. And all this with nary a drop of blood in sight - instead Mr Priestley creates an undercurrent of extreme terror with sounds in the night, ghostly visions, a bleak and featureless landscape, and familial madness. 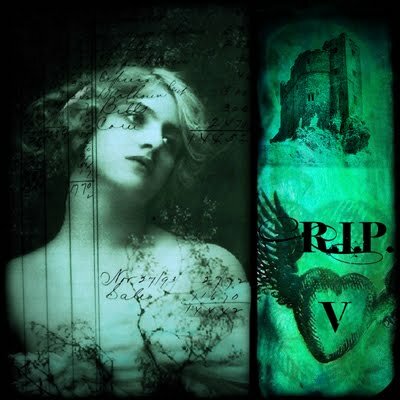 Chris Priestley freely admits that the ghost stories of Edgar Allen Poe and M.R. James are amongst his literary influences, even to the point of naming a book after the latter (the M stands for Montague, thus we have Uncle Montague's Tales of Terror). These influences are apparent in his short stories, and even more so in this novel, although Mr Priestley's writing, whilst Victorian in style, is far more accessible to younger readers. I feel that many children these days can struggle with the often wordy prose that many of the classic Victorian writers produced, yet the author manages to retain the Gothic feel but with an economy of language whereby he makes every word count as he builds the tension to almost unbearable levels. Chris Priestley says that as a writer it is "the mind [he]wants to unsettle, not the stomach" and he wants "to chill, to unnerve, to trouble". I think he will certainly have this effect on many of the readers of this book. 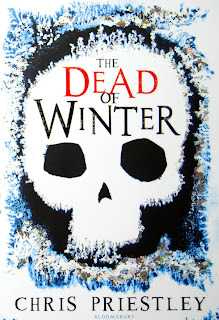 The Dead of Winter is due to be released on 4th October in hardcover with it's stunning (yet simple) dustjacket featuring a spooky skull and illustrated by the author himself. My thanks go to Bloomsbury for sending me a copy of the book to review. Today is Roald Dahl Day. Mr Dahl was such a huge influence in my early reading years that I felt I had to write some kind of post in tribute to the man who is arguably one of the greatest British children's writers of all time. There are so many reason why I love his books: his use (and creation of) words and language; the subversive nature of his stories; his vast array of colourful characters that have prety much entered our everyday language; and best of all, the delight I derived (and still do) from reading his books. My favourite Roald Dahl book is, and always will be, Charlie and the Chocolate Factory. It is one of the first books I can remember reading all by myself, and the name Willy Wonka is recognised pretty much worldwide, just as he was in the book, and his Oompa-Loompas have become a regular sight at England cricket matches around the world as a popular fancy dress choice for members of the Barmy Army. I also love the fact that it is the other children in this story that are the villains, as compared to many of his books where it was the adults who were the characters we loved to hate. A close second for me is The BFG. I don't think it is a coincidence that my two favourites out of all of his books had Roald Dahl at his most inventive as far as words were concerned, and I know I am not alone in thinking this. Just a couple of days ago a Twitter friend told me that she was inspired by one word alone: Whipplescrumptiousfudgemallowdelight! I had a lovely email from a young woman called Sarah. I taught her when she was seven. She has just graduated as a doctor in the USA. She reminisced about the story times I devoted to Fantastic Mr Fox and The Magic Finger, Danny the Champion of the World and Charlie and the Chocolate Factory. I worked my way through most of his novels at the end of the day and there was never a murmur from the kids on the mat. It made me realise how the great man's story telling magic made teaching easy. His mischief and invention illuminated the children's life. One of the greatest Human Beans....ever. It's hard to choose one favourite Roald Dahl book but my daughter and I really enjoyed reading his memoir - Going Solo. His real-life tales of Africa are every bit as thrilling as his wildest work of fiction and he cheated death on a number of occasions. The book includes a supporting cast of colourful characters and deadly snakes (usually colourful deadly snakes, in fact). If you ever find yourself face to face with a Green Mamba - run! Mysteriously, I didn't read an awful lot of Roald Dahl books when I was younger; not sure why??? The ones I did read (James & the Giant Peach, Charlie and the Chocolate factory/Great Glass Elevator), I enjoyed. But the one that had the most profound effect on me was Danny, Champion of the World. I borrowed it from the mobile library one wet and windy half term and devoured it in a day or two. I cherished its massive hardback form; it was such a HUGE book in my small hands, and turning the pages was like reading a old ledger. The story inside those pages was so simple, yet so powerful that it's still with me today. I liked the way Roald captured the relationship between a Dad and his lad, and wrapped it up in such an engaging, amusing and yet uncomplicated tale. I loved it, and I guess that's why I love to see my own children, and others too, reading Roald Dahl books today. His special kind of literary magic lives on! Roald Dahl made me a writer. When I was 8, my primary school class did a project on him, a look at "The Man Behind the Books" sort of thing, and that was the first time I realised that books were written by actual real people, and didn't just sort of magically appear in libraries when no-one was looking. I learned a lot about Roald Dahl that day, but I also learned something about myself: I wanted the same job as he had. I wanted to be the man behind some books. Twenty-four years later, I've finally succeeded. Were it not for Roald Dahl, I don't know if I would have. Pretty much the perfect combination of things to appeal to little me - playful language, sadness and loss, grotesque baddies, blissfully edible worlds like James's peach and Willy Wonka's chocolate factory. But the story that really struck me was 'The Wonderful Story of Henry Sugar', the first adult book I read, aged 11. I came to Roald Dahl late. I didn’t really ‘get’ reading until I was ten or eleven, then C S Lewis’s Narnia series showed me what I’d been missing. So by the time I picked up my first Dahl book I was a teenager – and it was the one that has been my favourite ever since: Charlie and the Chocolate Factory. In a way it was a good thing that I wasn’t eight years-old when I first read ‘Charlie’; I remember feeling the contrast of emotions – sadness at the plight of poor Charlie Bucket and his loving family, glee at the comeuppance of vile Veruca Salt and Violet Beauregarde – very strongly, which I don’t think would’ve happened before I was ten. Family relationships were portrayed so brilliantly – how I longed to jump onto the Buckets’ only bed and give each of Charlie’s grandparents a huge hug! Roald Dahl was a master story-teller, and I’m sure no author has influenced modern-day children’s writing more. I read a great deal of Dahl's children's books when I was younger. Despite his more notorious public and private life, Dahl was undeniably a phenomenal writer. I remember falling in love with the dark, strange stories he created. Below is a couple of the things that really struck a cord with me when I was younger. Roald Dahl is fantastic at coming up with great names of his characters. In The BFG for example, the names of the evil giants such as “Childchewer”, “Bloodbottler” and “Fleshlumpeater” brilliantly conjure up their ogrish images. The names are simple, but their directness is quite unnerving! Chewing children sounds horrible and painful (if you are a child reading the book); Bloodbottler, for me, creates an image of the giant draining the blood from children in a cold, industrial way; and Fleshlumpeater I imagine would shovel meat into his mouth from wherever he found it, including any human beans that got to near. When I was maybe seven or eight, I think I might have had nightmares because of these names! Dahl's books are also littered with children who suffer terrible fates. Dahl never seemed to hold back when writing about some very gruesome and blood-curdling situations. In The Witches for example, you hear about the witches placing terrible curses on children such as turning them to stone or having them trapped inside a painting for the rest of their lives. In Charlie and the Chocolate Factory, I remember reading about Augustus Gloop being sucked up in the river of chocolate and Violet Beauregarde being turned into a giant blueberry and then “juiced”. The way Dahl would write about these fates was truly chilling, and if memory serves, you don't learn the fate of the bad children. They may not have even survived Wonka's factory! Considering the age of the audience of Dahl's books, having these events within them seemed very brave. Yet it was the nastiness of these fates that made the books so brilliant: just because you were a child, you could still perish; you were not safe. This was horrifying and completely enthralling at the same time and made the books classics. You can see why I asked some professionals now can't you. Thank you so much to Alan, Tamsyn, Andrew, Barry, M.G., Julie and Alex for taking the time to share your thoughts with us. Have a great Roald Dahl Day (I'm going to read The BFG tonight). Nicholas Flamel was born in Paris on 28 September 1330. Nearly seven hundred years later, he is acknowledged as the greatest Alchemyst of his day. It is said that he discovered the secret of eternal life. The records show that he died in 1418. But his tomb is empty and Nicholas Flamel lives. The secret of eternal life is hidden within the book he protects - the Book of Abraham the Mage. It's the most powerful book that has ever existed. In the wrong hands, it will destroy the world. And that's exactly what Dr. John Dee plans to do when he steals it. Humankind won't know what's happening until it's too late. And if the prophecy is right, Sophie and Josh Newman are the only ones with the power to save the world as we know it. Sometimes legends are true. And Sophie and Josh Newman are about to find themselves in the middle of the greatest legend of all time. (In order to avoid spoilers, book details are for The Alchemyst, the first book in The Secrets of the Immortal Nicholas Flamel series). In my mind I hold a list of children's authors that I find truely inspirational, and near the top of that list is Michael Scott. For those of you who have never come across his Secrets of the Immortal Nicholas Flamel series then I both pity you and envy you. The first because you are missing out on one of the greatest fantasy series for young readers since Harry Potter, and the latter because I know what a huge treat you have in store for you should you ever start to read the first book in the series, The Alchemyst. It is to my great bewilderment that Michael Scott and his books are not better known in the UK, although his publisher tells me that over in the US readers just can't get enough of him (and I quote: "he’s practically worshipped in the US"). UK readers of The Book Zone I implore you to go to your local library/book shop/online retailer and rectify this! I remember exactly when and where I bought The Alchemyst, the first book in this series. It was on a day trip to London and my wife and I had gone to the Science Museum. At the end of our visit I wandered into the book shop there and saw this on display, shouting "Buy me!". I started reading it on the train on the way home and she had to drag me off when we got into our station. The Necromancer is the fourth book in a planned series of six, and at approximately 400 pages each you have some catching up to do. When I went away to Menorca for a week recently I treated myself by taking all four books with me as I had just received a copy of The Necromancer from the generous people at Random House and wanted to refresh myself of the story so far, and I enjoyed them just as much the second time around. 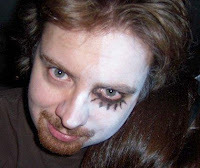 Michael Scott has an encyclopaedic knowledge of all things mythological and the series is laced with characters and events from the myths of myriad cultures and eras. You name it and it is probably in there: from Celtic to Mayan and Egyptian to Norse. 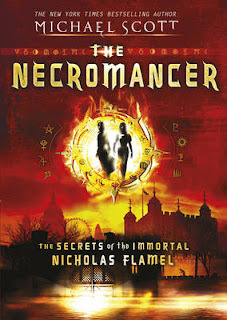 Although this post is supposed to be a review of The Necromancer, now that I have started writing it I have decided that it is an impossible task to do this without creating spoilers for books one to three (if you came here looking for a review of this book then please accept my apologies, but rest assured it is easily as good as its predeceesors). So instead I will just explain why I love this series so much. First of all there are the characters, every single one of them. The twins, Sophie and Josh, who are believed to be the magical twins of an ancient prophecy; Nicholas and Perenelle Flamel, the immortal alchemysts, who have dedicated their lives to protecting humanity from the forces of evil; Dr John Dee, one of said forces of evil; Scathach the ancient vampire, helping the Flamels in their fight; this list could go on and on and on. Every single character in these books brings their own special something to the story; yet even with so many bit-players the stories never seem overcrowded, such is the skill of the author in weaving them into the plot. And if you think you recognise some of these names then you would be correct in your thinking: Nicholas and Perenelle were real life alchemysts who lived in France in the 14th Century; John Dee was a 'comsultant' to Elizabeth I back in the 16th Century; and they don't stop there...... the likes of William Shakespeare, Billy the Kid, Joan of Arc and Niccolo Machiavelli all have a part to play in this epic fantasy story as well. The mythological elements in these books will have great appeal to boys. I grew up fascinated by the mythology of different cultures, and I wish i had more time these days to read more books about this. This series will inspire its readers to want to investigate the actual myths and legends on which the events and characters are base, and even if this is limited to quick scans of wikipedia this can only be a good thing. I have spent far too long googling the likes of Gilgamesh, Aiofe and Scathach, and Coatlicue when I should be doing other (possibly more pressing?)things. Some readers may struggle to keep up at times: these books are aimed at the 11+ age range but less confident readers may find them a little confusing. However, confident readers will devour the detailed plot. Most adults who discover these books will also gain a great deal of pleasure from reading them, in much the same way that they did with the Harry Potter series. I mentioned the detailed pot just now and although it is rich in detail it is also very fast paced, with some scenes so frantic that you feel light-headed at the end of them because you have been so engrossed you have forgotten to breathe properly. There is also much twisting and turning going on - Josh and Sophie never really know exactly who they should be trusting, even four books into the series. They have been told by Scathach that the only people they can really trust is each other, but as events unfold at such a dramatic rate will this even be the case by the end of the series. Reading back through this review I can feel my passion for this series emanating from my words, and I hope that is evident to all who read this review. If you love fantasy and still read and re-read the Harry Potter books, or want something a little more complex then this really is the series for you. There are four books in the series so far: The Alchemyst, The Magician, The Sorceress and The Necromancer, and according to Amazon book five, The Warlock, is currently scheduled for a May 2011 release. The second Jack Christie adventure finds our schoolboy hero travelling back in time to foil the plot to assassinate Elizabeth I. Meeting famous figures such as Marlowe and Shakespeare along the way, Jack and Angus must thwart the Revisionists and protect Queen Elizabeth’s throne. 322 days ago I created The Book Zone. The first review I wrote on that very same day was for Day of Assassins by Johnny O'Brien, the first book in his time travel adventure series featuring main character Jack Christie. Earlier this year the sequel, Day of Deliverance was released in stunning hardback format complete with die-cut sword slashes, and I managed to presuade the generous people at Templar Publishing that it would be a good idea to send me a copy to review. The first book in the series saw Jack going back in time to the years of the First World War as he stumbled into a plot to change history. This plot had been formulated by a group known as the Revisionists who are determined to make the future a better place (in their eyes) by interfering at critical moments in history. 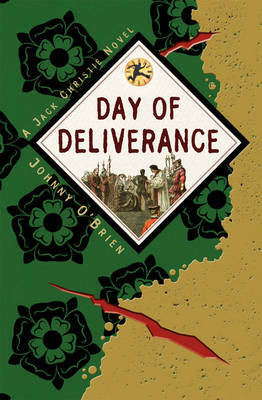 In Day of Deliverance Jack and his friend Angus are sent back to Elizabethan times by VIGIL, the organisation dedicated to ensuring that the Revisionists are prevented from abusing the time travel technology they have managed to develop. Whereas the first book was all about making difficult decisions, the sequel is very much more of a straightforward time travel adventure story; whilst I still thoroughly enjoyed Day of Deliverance I felt that it was therefore lacking something that made the first book a little more special. Of course, the events that happened in this period are far more removed from Jack (and us as readers) than those of the Great War when so may thousands died in action and issues such as the Spanish Armada and the execution of Mary Queen of Scots do not impact on us in the same way. The Tudor period is probably my favourite historical era and I love reading historical thrillers for adults set during this period. I was therefore really interested to see what Johnny O'Brien had in store for his young hero, and I wasn't disappointed. In the course of the story Jack Christie witnesses the aforementioned execution, meets William Shakespeare and Christopher Marlowe, and even finds himself with a particularly risky front row seat at the Armada battle itself. Mr O'Brien is a huge history buff and carries out very detailed research for his books, and as such the details about the period all come across as being very authentic from my layman's point of view. The plot itself is a little more straighforward than that of the first book in the series, but it is just as fast paced and there are more than enough swashbuckling action scenes to keep reluctant boy readers happy. Since the release of Day of the Assassins we have also seen the publication of the first two books in Alex Scarrow's TimeRiders series, but to compare the two would, I feel, be a little unfair. The Jack Christie adventures are most definitely for the younger 9+ age group, whilst Scarrow's books are more complex and their themes more suitable for the 12+ group. 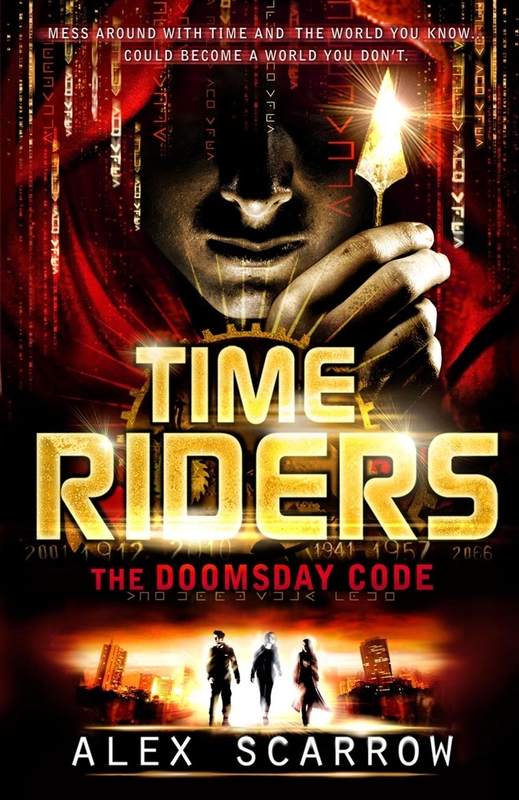 O'Brien's books are also more realistic in their historical nature as the concept of changing history to alter the future remains just that, whereas in the TimeRiders series we actually get to read about that alternate future. The third Jack Christie story is entitled Day of Vengeance and according to the Jack Christie website it is due out in 2011. I am looking forward to seeing where (or should that be when?) Johnny O'Brien takes Jack Christie next. Having just booked my FREE ticket for this FREE event I thought I would write a short post about it in case there are any London-based readers of the Book Zone out there. This event looks brilliant - top children's authors and great illustrators running workshops and reading from their books. And did I also say that it is all FREE?! 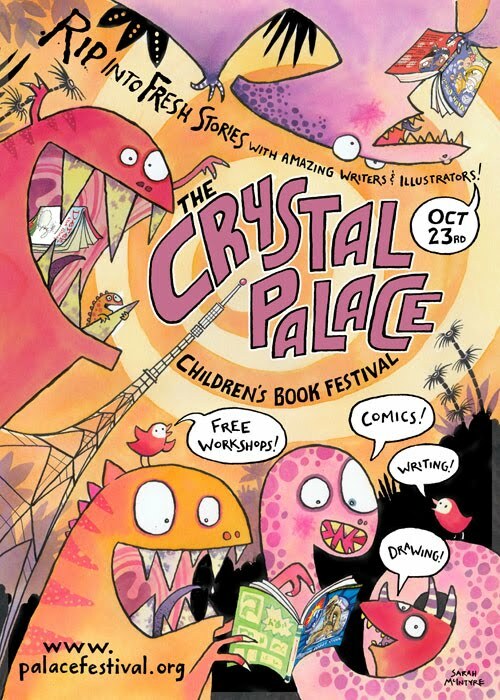 The Crystal Palace Children’s Book Festival was set up by writer/illustrator, Alex Milway, who created the excellent Mousehunter books, as well as the new Mythical 9th Division series. The festival is a little different to the norm, as it takes place over one day, and is run more like a music festival. All events are free, and we actively encourage visitors to hang around and meet and listen to new authors in the line-up. You never know what you might see, or what might inspire the next JK Rowling! Upon arrival, the three friends and their fellow visitors are taken captive and subjected to a series of tests of skill and stamina, all inspired by the myths and legends of Ancient Greece. As the ‘games’ become ever more deadly, a desperate struggle for survival ensues – and Alec must face his own terrifying challenge, deep in the dark heart of the labyrinth. Alec Devlin is back in his third adventure. If you have not yet come across Philip Caveney's books about his young adventurer then you have some catching up to do. The first book in the series, The Eye of the Serpent, introduced to Alec as he travelled to meet up with his archaeologist uncle, only to find himself up against the spirit of an ancient and powerful High Priest. Book two, Empire of the Skull, had Alec involved in a plane crash deep in the Mexican jungle, and then fighting for his life against a long lost tribe of Aztec warriors. Alec is the sort of boy who finds trouble wherever he goes; despite being headstrong and something of a risk taker it is not always his fault that he and his valet Coates seem to find themselves up against the nastiest of villains whenever they go away together. In the Maze of Death, Alec and Coates have travelled to Crete. Alec is soon to start university, studying anthropolgy, and despite the scrapes he has got into in the previous books he has presuaded his never-present father that he should be allowed to go to the Mediterranean island to see the excavations at Knossos and learn a little more about the ancient Minoan civilization. Accompanying them is Ethan Wade, a brash american who Alec met in his first adventure and who has since become Alec's (much needed) bodyguard. Despite promises to his father about staying out of trouble, it isn't long before the group find themselves up against a particularly nasty foe, the mysterious millionaire Tobias Wolfe, and boy is he one vicious villain. Alec has met evil before but Wolfe has to be the worst so far - he is clearly insane in that he believes he is the reincarnation of the ancient King Minos, and he uses other humans as entertainment in games and tests that resemble something out of the SAW movies. The Alec Devlin books are great for the 9+ age group. Yes they are violent at times, but there is rarely anything too graphic, and we all know that boys love a little blood in their stories. I really enjoyed The Eye of the Serpent, and found it very Young Indiana Jones-esque, although I did not enjoy Empire of the Skull quite as much as I found it a little too predictable. Maze of Death, however is a return to form for Philip Caveney. The main characters have now formed a close bond that is believable and laced with humorous banter, and the secondary characters are all well used in the story. The plot is fast-paced and taps into a love that many boys of this age share - ancient Greek mythology, including both the Icarus/Daedalus story and the ever-popular legend of Minotaur. in its labyrinth (the maze of death of the book's title). Philip Caveney is an author who knows what appeals to young boys and in Maze of Death he certainly delivers. As I mentioned in my recent review for Return to the Lost World, the 1920s is a great era in which to base an adventure story, before the advent of the micro-chip and silly gadgets, and the hero has to rely solely on his wits and the everyday items around him, and this time period is perfect for this story as well. I do have one small moan however - Alec is now two years older than he was in the first book, and there were many moments where I felt his character had not matured enough since The Eye of the Serpent, especially considering the harrowing near-death experiences he has faced since then. With this in mind, as he is about to enter University, I am left wondering whether another book in the series will work or has the series already come to a natureal end? My thanks go to the publisher for sending me a copy to review, all three books in the series are in print and should be available in all good book shops. 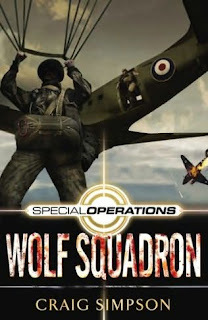 At the beginning of the summer I was asked by the people at Corgi books if I would like to receive a copy of Wolf Squadron, the third books in Craig Simpson's Special Operations series. It was with a little embarrassment that I had to admit that I had not yet read either of the first two books in the series, and within days the generous people at Corgi had sent me the full set to review. As I already had a huge To Be Read pile I spaced these books out over the summer, although after reading the first one I was sorely tempted to read them all in one go. These books are brilliant and I wish I had discovered them sooner. We have all three in the school library but I had never picked one up, and it makes me wonder how many other great books are out there that I have missed out on due to lack of time. The Special Operations series is set during World War II, not an era that has been particularly fashionable in kids and YA literature in recent years, but with these books Craig Simpson should be the man to change that. "What about Robert Muchamore's Henderson Boys series?" I hear you ask. Whilst I enjoyed those, in my opinion these are even better than the Henderson Boys. The Special Operations books follow the adventures of three 16-year old Norwegians - Finn Gunnersen, Loki Larson and Freya Haukelid - who have been recruited by the historically factual Special Operations Executive (S.O.E. ), an Top Secret organisation that was created in the fight against the Nazis during World War II. This isn't like CHERUB, H.I.V.E. or any of those other organisations using young people such as in the Alex Rider books - S.O.E. really existed and young people actually played an important part in the resistance movements of many of the occupied countries in Europe at that time. My knowledge of this era is not great so I do not know whether or not S.O.E. actually used agents as young as 16, but the WWII setting instantly makes these stories far more believable than any of those others I just mentioned. The reality aspect of the stories is also helped by the fact that the group's adventures are all based on real life events from this period, which Craig Simpson gives further details about in the postscript in each of the books. There have been three books released so far on this series: Dogfight, Death Ray and Wolf Squadron. Finn Gunnersen and his best friend, Loki, are mad about planes. Finn wants to follow in the footsteps of his father and become a pilot. But with the Second World War raging on and German soldiers invading his Norwegian village, flying isn't the only thing on his mind. The Resistance movement is making plans to reveal top-secret information to the British, and Finn and Loki are desperate to lend a hand. But, talking about risking your lives and actually doing it are two different things. Courage and determination takes them beyond Norwegian shores for more action-packed, full-throttle adventures. So get ready for take-off! Finn Gunnersen and his friends Loki and Freya have been recruited by the enigmatic 'X' as special agents, working for the Allies. Acting on information from the French resistance they are dispatched on Operation Death Ray to aid in the sabotage of vital German technology. But with suspected double agents in their midst and their loved ones held by the Gestapo, it's not just their own lives at risk if they fail...In a world at war, everyone has their part to play. As I have already mentioned, I think these books are brilliant and boys of 11+ will love them. 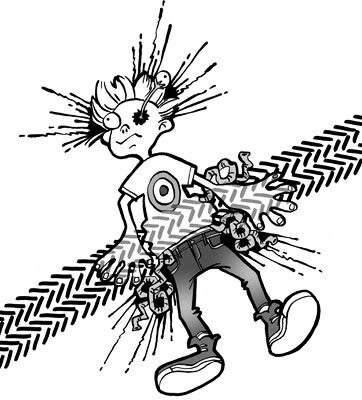 Younger boys who are confident readers will also find them hugely enjoyable, but sometimes the content may be a little violent for them. The events of the time period the books are set in have given the author a great starting point for his books, and as a talented author he has so far created three tightly plotted stories that twist and turn throughout. This was a time when your best friend or neighbour could easily turn out to be a Nazi collaborator and you had to be careful about who you trusted, and saying the wrong thing to the wrong person could find you and your friends and family facing a firing squad. The Nazis did not look sympathetically on members of the resistance or British spies, and so the tension levels in these books are almost unbearable at times - cliched though the concept is, these books are very difficult to put down. 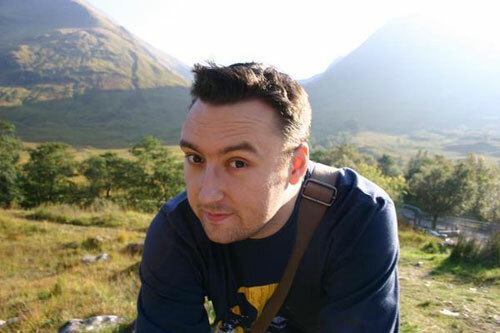 Craig Simpson has also created a very believable cast of characters, both primary and secondary. The three Norwegian teenagers each have their own reasons for putting their lives on the line for S.O.E., although for all three of them the main driving motivation is to see the Nazis expelled from Europe so they can return to a free Norway. However, it is their individual reasons for fighting that often cause the team problems, especially where Finn is concerned as he still grieves for his father who left Norway at the start of the war and went down in battle whilst flying a Spitfire for the Allies. Loki and Freya are also something of an item, and as such the decisions that Loki makes in some scenes are not always for the good of the mission - he is after all a teenager and emotions play an important part in the actions of him and his friends. If you enjoy fast-paced thrillers with great characters then these really are the books for you. The agents of the Special Operations Executive played a huge part throughout the whole of the war, and were key players in the D-Day landings in 1944. Wolf Squadron takes place in the summer of 1941, so Craig Simpson has plenty of time and events that he can use to write more books in the series - it would be great to see Finn, Loki and Freya take part in the Allied invasion that became a turning point of the whole war. 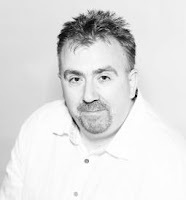 If you are interested in finding out more about Craig, his books and the real life Special Operations Executive then his website is well worth a visit.